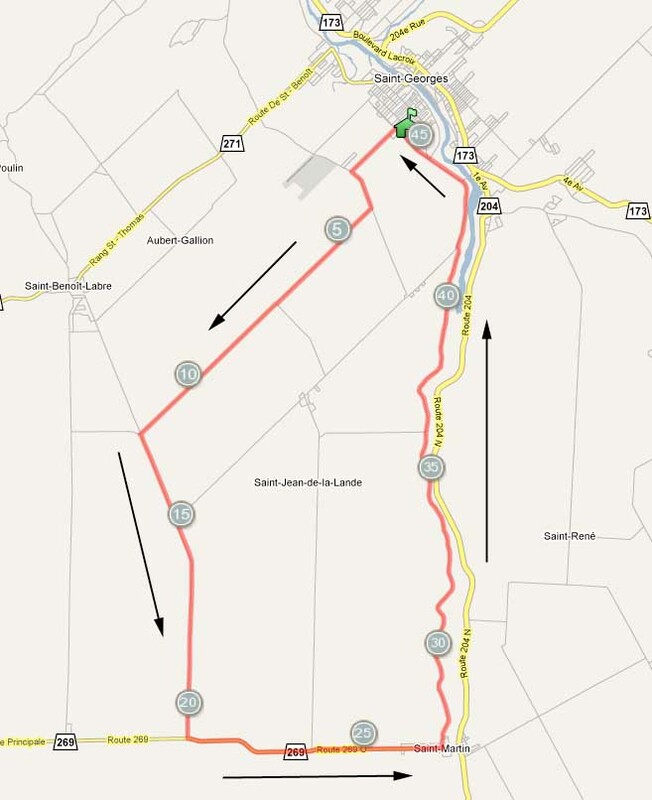 The men will do 4 laps of the 45 km course for a total of 180 km, start is scheduled for 11am. Earlier in the day it was "thick" with humidy with high cloud. The weather forecast has sun, rain and thunderstorms.. so WHO KNOWs what is coming. 30 minutes before the start it started to drizzle. This will make the corners slippery, but may make an early breakaway more feasible. 11:10am - At 1 km an attack by 81 ? was quickly joined by Osmond Bakker (EMD Serono-Specialized) and Charlie Bryer (Volharding). They have a gap of 15 seconds up the climb. Peloton is not interested in chasing. Heading out of town and the rain has stopped and the road is drying. 11:28 am - Charlie Bryer (Volharding), Jean-Michel Lachance (Pro Bike Pool Kuota) are away with a gap of 50 seconds. Marc Allard (Volkswagen-Specialized) had been with the the leaders but dropped off the pace. Peloton is still not chasing. 11:35 am - 16 km completed on lap 1 - Break group getting bigger as riders (mostly the U23 contingent) jump across from peloton: Osmond Bakker (EMD Serono-Specialized), Aaron Fillion (Ride With Rendall), Spencer Smitheman (Team Alberta) and more have joined the leaders. 12pm - 42.1 km covered in the first hour of racing. 12:12pm - Lap 2 has started and the break now has 8 + minutes on the peloton. Derrek Ivey (Team MCOR) has been trying to bridge up, but is sitting in "no man's land" 1/2 way in between the 2 groups. The peloton will soon have some work to do to get this race under control, but for now are willing to let things go. Planet Energy was at the front as the peloton came through to start the lap, but were not working too hard. 12:50 pm - 10 km to go before the end of the 2nd lap. An attack from the peloton with Zach Bell (Kelly Benefit Strategies), Derrek Ivey (Team MCOR), Christian Meier (Garmin-Slipstream), Jamie Sparling (Trek Red Truck p/b Mosaic Homes), John Stewart (The Hub Race Team). Peloton immediately reacted to bring them back. Gap suddenly dropped to lead bunch to 6 min. 1:10 pm - CORRECTION. Group of 6 have attacked from the peloton and are away and chasing. Zach Bell (Kelly Benefit Strategies), Christian Meier (Garmin-Slipstream), Charly Vives (Planet Energy), Keven Lacombe (Planet Energy), Derrek Ivey (Team MCOR), Jamie Sparling (Trek Red Truck p/b Mosaic Homes). They are now 3:30 in front of the peloton and 6 min back of the break. 1:17pm - Lap 3. Chasers are still trying to reel in the break. Christian Meier is doing the lion's share of the work with some assistance from the 2 Planet Energy riders. Gap is now 7:06 min. The pelton is at 3:14. 1:25pm - Peloton is starting to get serious. Andrew Pinfold (OUCH p/b Maxxis) has gone to the front on the climb and is pushing the pace. The pack is strung out behind. 1:37 pm - 15 km into Lap 3. Chase group at 7:45 and the pelton at another 3 min. 1:46 pm - Situation: Leaders with a chase group at 7 min. A second chase group of about 15 has now formed and are 3 min back of the Meier chase group and they are working hard to reel them in . ... Tuft, Parisien, Anderson, David Veilleux, Can Evans.. all the top riders who are not in the break or Meier group. 2:15pm - 54 km to go. Chase group 2 has just caught the Meier group and now form a group of ~ 30 that is what is left of the peloton. They are 7:05 down on leaders. Planet Energy has gone to the front and are working hard. 2:26 pm - Starting the final lap and the gap is 6:20. They have their work cut out for them!!!! 2:30 pm - 2 km in to the final lap. Kelly Benefits riders David Veilleux adn Ryan Anderson have come to the front to help Planet Energy and the gap is starting to drop. down below 6 min now. 2:50 pm - Riggs and Lachance caught. 3:20 pm - 5 km to go. Guillaume Boivin* (Volkswagen-Specialized) off the front of the break and has 5 seconds.